Introduces & explores key ideas in Astronomy! Introduces & explores our solar system! The first Science course in the fourth (and final) semester for Step 2, students ages 7-8, and for students of any age who are developing literacy. A massive course that covers what our sun is, the eight planets (and poor Pluto), moons, asteroids, comets, the Kuiper Belt and Oort Cloud, and other objects found in our solar system, along with what a galaxy is, and what a universe is. Many photos, films, and hands-on exercises help illustrate for the student the enormous nature of the universe. The space race and space exploration is also investigated. Great fun, and a wonderful learning experience in science, even as literacy and study skills are developed. 19 full lessons, 10 weeks plus a test and answer guide. What is a sun, and about our sun. An overview of our solar system. 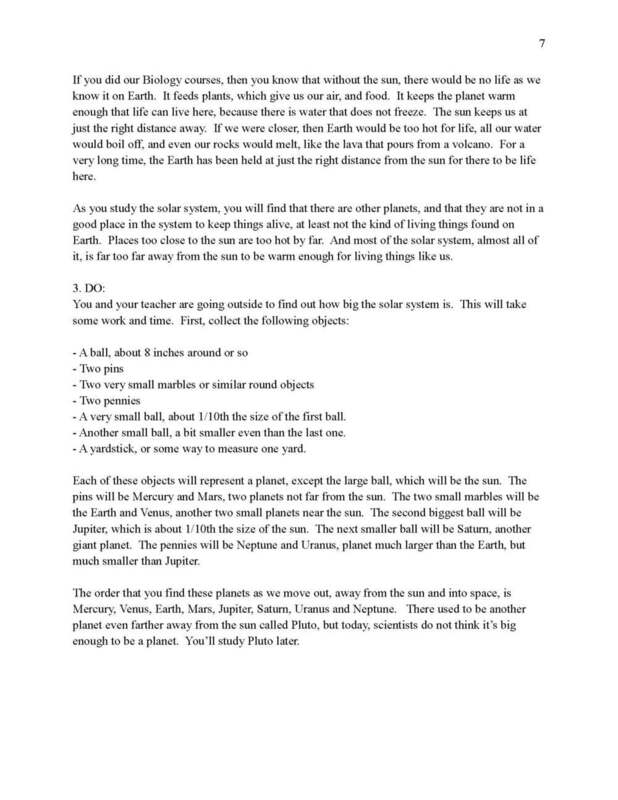 Lessons on each planet in the solar system. The Sad Tale of Pluto.